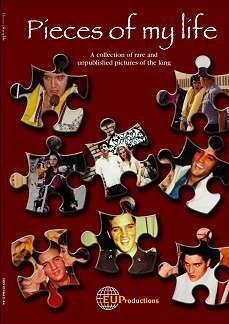 Pieces Of My Life is Elvis Unlimited fifth book and contains more than 200 pictures of Elvis at work and in private. Several of them are unpublished before. Spanning from 1953 to 1977 the pictures are found on 80 pages, several of the photos are black and white, though most of them in colors. This book is similiar to All Elvis. However, this time EU has mentioned where the actual pictures comes from. This is vital information for Elvis fans. You will still find some undated pictures, but they are a minority. A welcomed change! Photos that I find most valuable are Elvis at the piano in Cincinatti (p. 79), Elvis on his Harley Davidson (p. 49) and Elvis collecting eggs (p. 42). The format is letter 8 1/2 x 11 in soft cover. Given the rather nice price I would recommend this book. Value for money! The price is as low as 149 DKK or $ 18.